This refurbished Candela Alex Trivantage machine is a high-performance pigment removal system. Its powerful removal capabilities work on a wide variety of skin types and can relieve many disfiguring skin conditions. In addition, the Alex Trivantage does not cause unwanted changes in skin tone or pigment due to its closely tailored Long-Pulse 755nm wavelength. It is truly a revolutionary product. Syneron and Candela are providers of cutting-edge aesthetic medical devices. Over ten million procedures are performed annually using their products. Working together with scientists and physicians, Syneron and Candela have made aesthetic medical procedures safer and easier as time goes on. Many of their devices are used for hair removal, anti-aging treatments, and skin rejuvenation. They also specialize in machines designed for liposuction procedures. 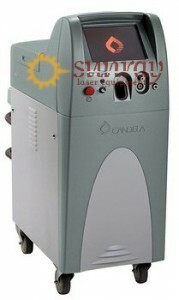 SunRayLaser.Com provides top-quality refurbished medical laser products to physicians’ and estheticians’ offices. Our expert team of technicians can recondition equipment and make them as good as new. We have a incredible inventory of products to suit every need. We pass the savings on to the buyers instead of passing on the costs! Your office can save up to sixty percent off the retail cost of medical laser products if you choose to purchase a refurbished piece of equipment from us. If you want to purchase this refurbished Candela Alex Trivantage or any other similar refurbished medical grade laser equipment, do not hesitate to contact SunRayLaser.Com today for a consultation.